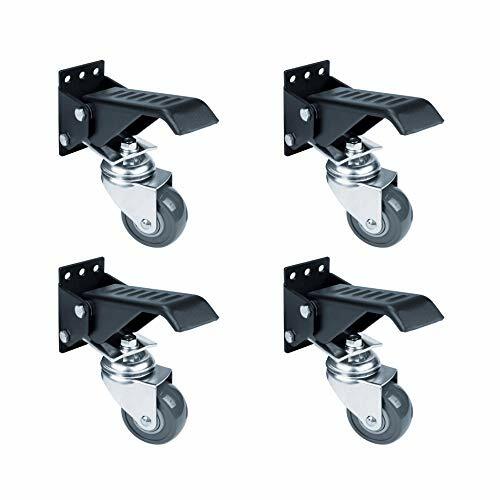 The POWERTEC 17001 Workbench Caster 4-Pack Kit with Multiple Mounting Options is the perfect solution for positioning your heavy workbench to any desired area in your shop. By simply pressing the foot pedal, you can elevate your workbench off the floor (3/4-Inch) and effortlessly move it to any desired location. When ideally placed, just lift up the foot pedal and lower table firmly back onto the floor for grounded stability; it is that easy. Constructed of durable carbon steel, these casters shoulder the weight so you do not have to. Each 2-3/8" urethane caster can support 100 lbs. (400 lbs. combined capacity) and offers a non-marring, smooth rolling action. Experience ease of movement with the caster's 360 degree pivoting action. Six predrilled holes offer secure and hassle-free installation while allowing for multiple mounting options. The added mounting holes allow for a more secure and custom caster installation, a convenient advantage over other similar casters. All mounting hardware included.